By Jay Atlas, Go Shuck An Oyster's newest writer and we are so excited to have him join the team! Anyone who lives in Boston or visits regularly knows about Legal Seafood, one of our Boston traditions. Most would lead you to have their clam chowder which has been served at 1600 Pennsylvania Avenue. Perhaps less well known, but equally "worth a trip" is their continuing changing variety of oysters served in several forms, but, for me, the only true form, is "on the half shell". I visited with Legal Seafood in Burlington, MA last Thursday where 5 oysters were being offered. The General Manager, Grant Trest, and the evening's Manager, Emily McTiernn were very gracious in their treatment of our little dinner party. The atmosphere is very nautical and sets the stage for very fine shore dining. I followed these with Merry oysters from Duxbury, MA. Salty, very meaty, clean and full flavored, they would normally have been my "go to choice" (4/5 oysters). The most pleasant surprise of the evening was Naked Cowboy oysters from Long Island Sound. (5/5 oysters). Incredibly sweet, full tasting and very meaty. Just Goldilocks perfect for saltiness. 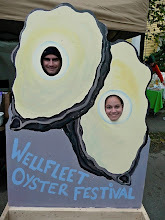 Last, but not least I had oysters from Wianno which come from Nantucket Sound, MA. By far the saltiest which was a little overwhelming. They were light tasting, clean and good. (3/5 oysters). Now, I like my beer dark and my wine very bold, so it is no surprise that I love my oysters big and brash as well. Congrats Cowboys and Legal Seafood for "making my day". Legal Seafood in Burlington also has a special going on Monday through Friday from 4-6 p.m. DOLLAR OYSTERS! Can you believe it! Stop by and tell them Jay from Go Shuck An Oyster set you.